Review: After reading the summary, I wondered if this was one of those crying books. There are many people who seek out the books that require tissues, but I am not one of them. Puffy eyes and a stuffy nose after reading sessions is not the result I am usually seeking. The unique plot seemed worth the risk though. Before his illness, Sora enjoyed playing baseball and dreamed of being a professor. After his diagnosis though, he doesn’t know who he is and how to be himself. He doesn’t really have peers in his life once he stops going to school, so he turns to chat rooms. The internet makes it so much easier since nobody there sees him as a tragic figure. He can be more than his illness. He can be anyone. Online he finds two people to interact with that quickly become his friends. Kaito and Mai joke with him and share the ups and downs of their days. They bring many of the lighter moments of the novel. He’s able to forget some of his challenges while chatting with them and later hanging out with them in person. Often he wants to forget about ALS and his impending death, but sometimes he wants to talk about it. His family avoids or silences his questions about death. But Sora is wrestling with what happens when you die. He begins to consider how he wants to live his last days. The Last Leaves Falling brings readers to a place that may be uncomfortable. In many societies death is a topic to avoid. It’s not something we discuss in depth on a daily basis. Often, if a loved one is facing death, we still focus on the positives as if by talking about it we are being disloyal. As if by saying the word we are condemning them to death ourselves. We don’t want to make it seem like there is no hope for recovery even if that is truly the case. This is where Sora finds frustration. He knows death is the only possible outcome so he wants to prepare, but his mother and grandparents aren’t ready to go there with him. Sora’s voice rang true to me. He expresses his frustration and confusion about what he is meant to do when his life is being cut short and he seemingly has no choice or control anymore. There is no how-to guide for this. Nobody plans for such a situation. His new friends are one of the ways that he copes. Through helping them with their daily struggles, he finds meaning and begins to see that he still has some say in his own life. He also finds meaning through a book of death poems. Some are beautiful and some are harsh, but the poems help him process his own experience. The authors were samurai facing their last days. They were willing to look death in the eye and speak of it when no one else around him will. I can’t say whether readers will need a box of tissues, but my eyes did not stay dry. I couldn’t help but think of the song from Rent, “Seasons of Love.” The song asks, “How do you measure the life of a woman or a man?” Sora is looking at his life and his last days wondering what it is that truly matters. He also explores how he can keep his dignity as he comes closer and closer to death and loses more and more control. This is a book that could lead to a lot of thinking. It will stick with me for a long time. It may also finally get my body down to the hospital to fill out my advance directive paperwork. Yes, this book may take you there. Recommendation: Get it soon if you are a fan of contemporary books and are willing to venture down this path. 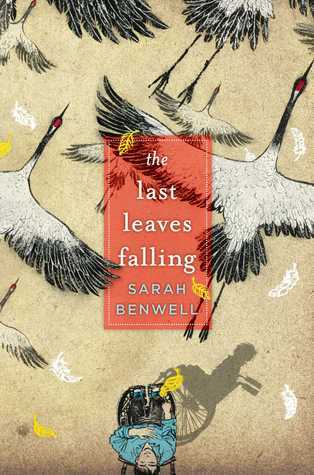 Benwell bravely brings readers on a journey that we often try to avoid, but it’s one that we will all deal with in some form eventually. I’m glad that I took the chance. I was rewarded with a beautiful story that made me think and feel and aren’t those the best? This sounds wonderful, Crystal. I’ve put it on my wish list! FYI-I have made flan, & while it’s labor intensive, it turned out so good to eat. Thanks for such a detailed review! So glad you enjoyed Last Leaves. It’s a tough, but rewarding story and I loved it so much. I recommend it to everyone, but have have sadly had difficulty finding the words to review it. Maybe one day!